So you’ve bought an old car and are wondering about plating it. In most states you have a choice: You can slap regular plates on it or you can save a bunch of money by putting on a “Historic” or “Antique” plate on it. But those plates come at a cost. A few years back I owned an old Army truck. Besides being big, it was old enough to qualify for Historical Vehicle plates from the state of Michigan. That is, it was over 26 years old. Why would someone want to get these plates rather than the civilian ones? They cost a lot less. $30 later and your old vehicle is legal to drive for ten years. I certify this historical vehicle is owned solely as a collector’s item and is used only for historical club activities, parades, car shows, etc. and not for routine transportation. 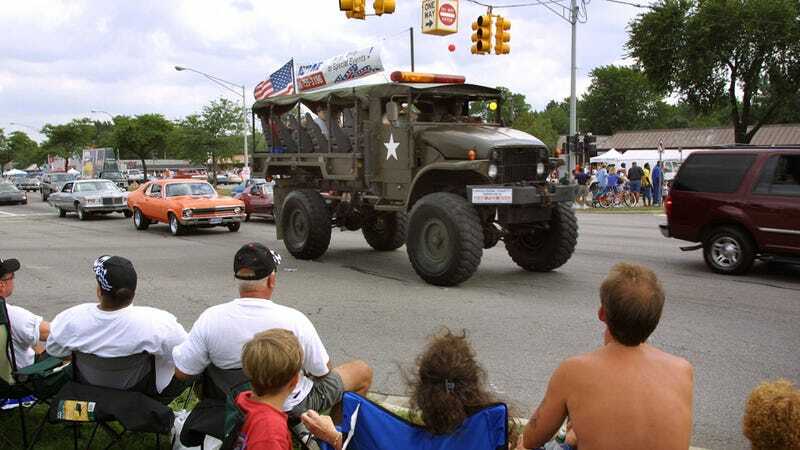 “Historic vehicle” means a vehicle that is over 25 years old, and that is owned solely as a collector’s item and for participation in club activities, exhibitions, tours, parades, and similar uses, including mechanical testing, but is not used for general transportation. For purposes of this section, use of the vehicle during the month of August in each year is considered an exhibition. Yes, I see that the statute says 25 years and the application says 26. But, as they say, it’s close enough for government work. The upshot is that if you have a historic plate on your vehicle, you saved a ton of money. The downside is that a police officer can pull you over and ask you where you are going. If he/she doesn’t believe that there is a club event on a Thursday morning at your place of work, you might find yourself getting ticketed. And that is what inspired me to write this piece: An email I received from a reader here who was pulled over by a police officer on a weekday morning while driving his car with historic plates. He talked his way out of a ticket but others are not always so lucky. Get a ticket like this and you will find yourself in court trying to convince a judge that you had a legitimate “similar use” for your vehicle that day. Bring the car to the Woodward Dream Cruise a day or two early? That used to get people in trouble but you’ll notice the “month of August” exception. It was created because of the Dream Cruise. Practically speaking, if you get a ticket for violating this law and you did have a legitimate event you were going to, just snap some pics of your car parked someplace nice with people walking around it. See if you can get it taken near another old car or two. After all, “exhibition” is an awfully loose term. It’ll come down to the mood of the judge and whether or not you pissed off the cop. And we’ve talked about that before. Check the law in your state to see what squirrel terms there are in your statute. Then try and keep a low profile. You may have a license to drive that car but it isn’t a license to smoke the tires for 30 seconds in front of the Dairy Deluxe.